Royal Mail's gold medal stamp compendium - a review. 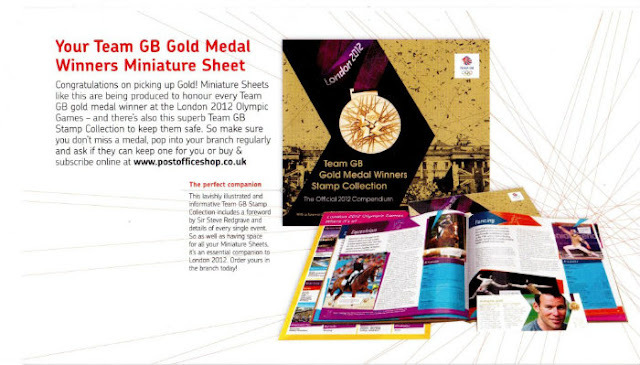 As well as publicising the Gold Medal Stamps widely in the media, Royal Mail also advertised an 'Official 2012 Compendium' to house the miniature sheets. "With a foreword by five-time Olympic gold medallist Sir Steve Redgrave, the richly illustrated, informative and Official 2012 Compendium is tailor-made to keep every single Gold Medal Winners Miniature Sheet safe for posterity and makes a superb companion to the Games." "I just recieved my compendium through the post and have to say it is not as I expected it to be. As described there are 14 printed inserts depicting leading medal contenders, which are inserted into the 14 see through sleeves which are described as - 'to keep your gold medal stamps in pristine condition.' To store the 29 gold stamp minisheets will require 15 doubled up so 1 will have to be loose as will all the contenders inserts. I would value your opinion and that of others reading you blog and I am aware that Royal Mail see your blog so am hoping they will realise the issues in this rather expensive album. If people order the full set of mini sheets from Royal Mail are you aware if these will come supplied in sleeves or anything to slip into this album?" I didn't order any as I thought it was an expensive addition to the probably large bill for the stamps themselves, so I don't know whether this is hardback - I'm told that it IS hardback. (unlikely) - perhaps somebody else can comment. And although RM were selling collections of 19 with the 20th free if you ordered by a certain date, the album only has room for 14. As for how the mini-sheets are sent from Edinburgh, I expect they will be in the usual black carrier unless you ordered multiples of 4 in which case you will probably get the complete A4 sheet between boards in a large padded envelope. UPDATE 25 August: Royal Mail's website now has a FAQ about the Olympic and Paralympic Gold Medal Winners Stamps. This includes a comment on the Compendium, and also announces an Album to hold all the Gold Medal Stamps. Whether this will be for single stamps or miniature sheets is not stated. Q: I have bought the Olympic Gold Medal stamps compendium. It has only 14 sleeves so how do I contain the GM stamps? A: Customers can insert two Gold Medal miniature sheets in each sleeve, facing out. The sleeves are designed to contain up to five miniature sheets, and hence the 29th mini sheet could be inserted within a sleeve also. UPDATED 29 August (see comments) - New Olympics album available at RM's website. Did you order the compendium? What do you think of it - leave a comment, or email me. We know of an alternative album for anybody who has still to house their Gold Medal stamps - visit Dauwalder's of Salisbury at this link. We have not seen their albums so cannot make a recommendation but we do know that they are a reputable company and their products are widely used. I ordered one in response to a RM mailing received in early May; when I also subscribed to the Miniature Sheet Collection which was being offered at a 10% discount if ordered before 31 May (I seem to remember seeing that that date was subsequently extended into June (15th? ), probably in response to RM's attrocious mailing efforts, etc around that time). Maybe, given the final tally, they should now do what they did with their covers offer and include the 20th sheet for free!!!!!! The book duly arrived in (quite) early July if I remember correctly. Strangely, the first thing that caught my eye was that it was printed in China!!!! How could RM be so stupid as to not support GB businesses with such a high profile event? As for the content, I wasn't overly impressed with some of their 'going for gold' choices (eg Heather Fell for the Modern Pentathlon when she wasn't even in it), but then I suppose they had rather advanced printing deadlines to meet and needed to cover as many sports as possible; even those where GB had no realistic chance of getting anything, eg basketball. And they did get quite a few of the other 'predictions' correct, eg Peter Wilson & Jade Jones. I admit to not having read all the nitty gritty!! As for the plastic sheet holders, there are only the 14 if you include the 'spare' one inside the penultimate 'blank' sheet. The main point, though, is that inserting 2 sheets back to back in each holder will not address the 'problem' of lining them up with their winning sports, eg we didn't win any in acquatics or archery where the first holder is placed, but won multiples (for once!!) in the athletics. Maybe, on reflection and with the wonderful benefit of hindsight, it would have been better to provide 'loose' (but 'gummed') pockets which purchasers could then have stuck in the appropriate page when winners were known. I haven't actually decided at this point in time whether to actually use the book to keep the sheets in. It may depend on whether RM package them in a 'year collection'-type container or just send them all loose. Will wait and see. Whilst I commend and congratulate all the Team GB competitors for their efforts and the excellent medal tally, it's made it all that much more expensive for the philatelists and other 'momentous occasion' collectors amongst us! And no doubt RM will find more ways to get us to part with more money; maybe, with composite sheets of winners or whatever??!! Some interesting points here mike. I too was wondering how best to display the 29 sheets and was initially disappointed to hear that the compendiums had sold out - not too sure now though to be honest! I was wondering how RM will display the stamps in their 'delux' range of pages, either as whole sheets or as singles? (that's another £17 for a set of singles!!!!!!!). I might just get a set of lighthouse grande refil pages as i have each sheet with a '30th Olympiad' side perforation and knock up a front page and create a sub section in another album! I'd interested to here from anyone as to how they are displaying theirs. On the plus side, hardcover, slip case. Come on Royal Mail, supply the 29 miniature sheets with either another 2 plastic wallets we can iron into the album (leaves a spare to store the printed inserts) with 15 pieces of archive paper suitable to place in between 2 sheets (to stop them sticking together when placed back-to-back in the wallets), or maybe supply another 16 and we can insert one sheet per sleeve. After spending almost £128 (including £14 bulky-item handling charge! ), I'd probably even consider spending another £16 for 16 more sleeves to sort it out. Seriously, find a simple solution and make us happy. This may be a silly question but I'm new to all this but does anybody know if clear plastic sleeves the same size as those already in the compendium are available to purchase any where. No question is a silly question (unless you fail to notice that the answer has already been given, which in this case it hasn't). I can't answer. What you need, of course, is something with archival qualities. I already have the compendium you see and the stamp sheets are on the way, I was thinking of adding extra sleeves to the gold pages at the front and back of the compendium to display all of the stamp sheets and still keep the inserts relating to each sport. I am seriously considering sending it back, exercising my rights under the Distance Selling Regulations. Just waiting for Royal Mail to respond to my query about whether they will supply additional plastic pockets to hold all the sheets and sport inserts before deciding one way or the other. According to Royal Mail & Collectables on their Facebook page, Royal Mail are 'considering options' to solve the shortfall of the compendium. Hopefully they will come up with something to satisfy us all! Thank you John, that is indeed good news. I'll ask them to put something on twitter as well as I don't use FB. "Royal Mail Stamps & Collectibles Hi Simon - unfortunately there are no extra sleeves to buy. We won more medals than we anticipated! You can look at purchasing another type of protector elsewhere, or otherwise, I'd suggest putting three in one sleeve"
Think I'm going to be returning my compendium now and look at buying a different type of folder to display them in. Thanks TANK/Simon - I'm still hoping to hear from RM that they have a better solution. I have made sure that RM HQ are aware of various comments here. Meanwhile you might like to look at options for storage mentioned by other commenters. From the sounds of it the solution their working towards would involve something completely different not just an addition to the current compendium so I've decided to sell my compendium on now and get an A4 folder with the triple pocket inserts for the stamps, that way I can add extra's for some of the other olympic things I've collected (presentation packs, my event tickets, programmes and a few stamp sets from Aus and Canada). Excellent, thanks for that Ian. My solution to this little problem would be to just buy one of those nice presentation pack albums from good old WH Smith. They do the job adequetley, with plenty of protection. I was going to order the Compendium, but as it's now sold out and doesn't appear to be quite right now for the number of Gold Medal winners, I'm glad I've saved the £20. £104 for all the stamps is quite enough!! I don't wish to advertise but I have come across this Album from Stanley Gibbons which might just help anyone who does not want the RM Compendium? House all of your Great Britain 2012 Olympic Stamp Sheets, including the Gold Medal Winners sheets, in our maroon 4-ring binder. The Olympic sheets issued by Royal Mail are larger than normal and so we have produced this album especially to enable collectors to store and present them safely. The album comes with 10 single pocket stamp sheet leaves measuring 315 x 250mm. Please note 3 pocket Cosmic leaves are available seperatley to house the sets of miniature sheets which have also been issed by the Royal Mail for each Gold Medal winner. (Item no: RCOS003). Thanks Robert. The album is for A4 sheets, though the 3-pocket pages (http://www.stanleygibbons.com/stanleygibbons/view/product/sgproductcatalog/7878/7975/7976/SG54766) will certainly be good for the miniature sheets. They will, of course, fit into any wide 4-ring binder. I am awaiting response from my email to royal mail, glad to see it is being looked into by them and that others are disappointed with this. A simple answer woul has been to put a set of wallets in the rear of the compendium thus keeping te inserts on a relevant page and as it was always going to be unknown how many medals for each sport would be won. They could ten be displayed in order safely at the back this could still be done if they supply a pack to insert. Look, if RM had put any thought to the project in the first place, the Compendium would have been issued AFTER the Olympics to include the actual winners and not people the didn't even feature in the Games! But now we are stuck with a useless Hardback Book and 20 quid out of pocket to boot! I would second this comment. It smacks of poor planning on RM's part. The compendium only has 14 plastic pockets (one of which is at the very back, on a blank page - the rest are interspersed throughout the illustrated pages of the book), so RM's claims that the Compendium "is tailor-made to keep every single Gold Medal Winners Miniature Sheet safe for posterity" is cobblers! They always worked on the basis that the sheets would need to be doubled-up in the plastic pockets (as they thought they would be dealing with around 20 sheets), and don't seem to care that they have misled everyone who was expecting something that they could actually be proud to own. The Compendium does not "keep every single Gold Medal Winners Miniature Sheet safe" if you have to double them up, and even less so if you follow RM's latest line (on Twitter) that "You will have to put 3 minisheets into one sleeve". RM need to get a grip, and give a commitment NOW that they are going to sort this out for people (even if it takes them a while to figure out how to do that). I just called Stanley Gibbons and was informed that they will be receiving the albums on Friday into their warehouse but will be available on Monday. The chap explained that there would be 10 sheets so not enough to accommodate all the winning stamps so 2 extra sheets would be required to house the full set for a cost of 6.25 each. I asked him about the visibility of the branding etc but he said he does not know yet but would let me know when he sees them. Somebody should have made decision on this, I hope. They may provide pages for both, and we will be selling singles. Lighthouse have never worried about you splitting Prestige books or Smilers sheets so I would imagine they will also expect you to cut up the miniature sheets. Why do firms print limited number of these things so frustrating and also should limit of one per person to save those ebay people putting up for over 100 pounds. As he has some technical issues Steve has asked me to add this reply, which clarifies the Lighthouse album position. outlay for the sheets themselves (£104.40). getting daily enquiries about this very subject. I shall respond saying that I would welcome supplements for the complete mini-sheets as I do not wish to purchase single stamps cut from sheets – although if Royal Mail chose to issue a presentation pack of die-cut singles that might be another matter. If you can add this to your blog, other readers might also like to contact Duncannon with their views. If anyone is interested - Dauwalders of Salisbury (01722 412100)have an album to take the single stamps and also they have a binder with pages wide enough to take the miniature sheets with the selvedge edge. I think you only need look at Dauwalders' sets of 29 stamps cut from sheets to see what a scruffy option this is going to be. Hi, I have bought the Gold Medal Winners Stamp Compendium thinking I would receive the stamps too. Can anyone give me an answer to this because the Royal Mail website has taken sown the page for it. Thank you. It's amazing what people think they have ordered, and it's nothing like reality. Another contact thought that if he paid for the first 19 he would (per the Royal Mail offer) get all subsequent stamp sheets and FDCs for free! The album is an album FOR YOU TO PUT YOUR STAMPS IN. Read the advert on the envelope up above there; it says "make sure you don't miss any, pop in to your post office regularly and ask if they can keep them for you....."
I have ordered a item from Dewalder's apparently they are all printed up for the gold medal winner stamps, and Stanley gibbons are not also it is a lot cheaper. I have been very disappointed with the way Royal mail have sent the Gold medal winner stamps out, as the are being placed in torn sleeves so as to get the maximum in each and then posted in a flimsy envelope. I have off course sent them back. even the paper work inside had been stapled together which of course would not do the contents any good during its delivery span. then an elastic band round them by the postman to keep his bundles together.I can only assume that Royal mail have been using staff to process these stamps that have no idea what they are doing. It's been interesting to read all the comments about the Team GB Gold Medal Winners Stamp Compendium . I added one to my 'basket' and before I could pay, my husband was taken into hospital as an emergency. Then when I came back to site, I discovered they had all sold out. So I looked on eBay - DON'T GO THERE.......silly if not criminal prices - anything from £50 to over £200. - I find this had to believe and wish there was some way to warn people.....now I'm not sure if I want to purchase the stamps as I thought they came as a presentation pack. - am I wrong? Royal Mail have never mentioned a presentation pack in respect of this issue and it seems very unlikely given the various printing and supply operations involved. Staff at my local post office are under the impression that another, hopefully better, compendium is to be printed in the near future. No mention of refunds or exchanges for those of us unfortunate enough to have purchased the original album...! I didn't order the album as it was suspect as to what was in it. My suspicions have been proved correct! I did however order the 29 mini sheets which I hope are on the way to me now. However this album can be used by collectors to store other Olympic stamps which are not the gold medal winner stamp mini sheets. I think it is quite obvious what the RM should do now. They should print a new album (similar to their year books) which has 29 pages in it plus a few more for an introduction etc. Each of the 29 pages should have a description of the gold medal winner/winners with a space for the related mini sheet. This album should be sold with or without the stamps as they have seriously messed this up; I for one do not intend to buy another 29 mini sheets if they come in this album as standard! I would like the no stamps option. The album I mentioned should be available for the Christmas market. It would make a super Christmas present. Apologies if this is somewhere in the post but I bought mine in the belief that I would at least get a stamp for each winner? Is this not the case and essentially it is just a glorified folder with a c**p pre-match programme which is meaningless anyway? Feel a bid misold to be honest. I want a stamp with each medal winner more than anything. I'm amazed at how many people are complaining not about the product itself but that there are no stamps in it! There were never going to be stamps, this was a folder to hold your stamp sheets, and the publicity material made that clear, even suggesting that you should ask your local PO to keep the sheets for you. So you really expected a hard-back book in a slip case, together with stamps if, even if there had only been 20 gold medalwinners, would have cost you £12 for the stamps alone! Here's a tip, though it may be too late for you now. The law allows you to return anything bought by mail order, or over the internet, within 7 days, for a full refund. You have to pay for the return and the items have to be resaleable, but that's your right in law. Mind you if you were one of the foolish people who paid over £100 on eBay, without being sure what you were getting, that's a different matter unless it was a business seller. "With a foreword by five-time Olympic gold medallist Sir Steve Redgrave, this informative, official Compendium is designed to keep Gold Medal Winners Miniature Sheets safe. Every gold medal win, whether by an individual or a team, will feature on a separate commemorative Miniature Sheet comprising of six Special Stamps. Names, disciplines and event details will appear in the border, together with the official Team GB logo. Subscribe before 31st May to receive them all straight after the games, and get the 20th free ? if Team GB wins one more gold than at Beijing! Important pricing information: We are basing the price of your subscription on Team GB repeating their 19 gold medal wins at Beijing. If Team GB win 20 Gold Medals, you?ll receive the 20th free but will be charged for any wins after 20 gold medals. If Team GB win less than 19 gold medals, you will only be charged for those won. We will not take any payment until 13th August 2012 when the Team GB gold medal winners will be known. You will be contacted prior to payment. We're proud to announce a Royal Mail first. Each Team GB hero who wins a Gold Medal will be immortalised in a First Class Miniature Sheet. DON'T MISS OUT on this once-in-a-lifetime opportunity to own these very special gold medal items. Call 0845 266 8756 today to find out more." I think that is a little misleading!! "You think" ? But you don't say where you saw the advertisement. Certainly all those words have been used by Royal Mail in conjunction with the Gold Medal Winners stamps promotions. But I think you have merged two things, and the text is not in the order I saw it. The subscription for the gold medal stamps and first day covers (sign up and get the 20th free) was two offers, and the Compendium was something entirely different. You did not, presumably, sign up for the subscription but have already parted with the money for the compendium. You can't possibly have expected to get the sheets of 6 stamps (£3.60 per sheet) for £20 whether there were 19, 20 or 29 medals??? I got it from another website. I can't remember the exact wording but they were mixed and I think, given what other people have been saying, was confusing. No, I didn't expect all 6 stamps but maybe one per medal winner. It's only 60p per stamp no? Anyway, I don't think it is worth £20 for a programme which is all it is. Does anyone have intelligence on whether they will be re-issuing? Re-issuing what? The book that you don't like anyway. You describe it as a programme, but I think a hard-backed book with slip case is not the sort of programme you normally get at a sporting event. It's a coffee-table book. Very disappointed with the service regarding the purchase of the Olympic medal winner sheets. I placed my order on the 10th of August and they still have not arrived, on ringing Royal mail up the just inform me that they are very busy and I could have to weight for a least another week, and they have not got any idea when they are going to be dispatched.On line it says dispatched in 5 working days on the phone message is at least 10 working days, speak to some one and they have not got a clue.In my opinion a very disappointing service. The online reference is clearly wrong and should have been changed by now. The Philatelic service has been overwhelmed by demand for these, partly because some POs sold out and were told that they would not get any more supplies, something which subsequently proved to be wrong, as they were replenished with unsold stocks from others. By then the damage was done as customers had been told to go to larger offices or to buy online. If it's any consolation we pre-ordered ours in May as dealers, and apart from numbers 3-5 which are lost in the system somewhere, we have been getting stocks every few days - but are still waiting for medal numbers 27-29. Meanwhile I see people on eBay selling complete sets, one person having sold over 400 - 70 MS worth! Chill out pal. Some quite innocent questions. Call it what you like - it's not worth £20. Reason why I query re-issues is the value of the product in future. Ebay seems to be doing a roaring trade. You wrote "Does anyone have intelligence on whether they will be re-issuing?" having previously written that the product was "it is just a glorified folder with a c**p pre-match programme which is meaningless anyway? " I wasn't at all certain whether you were asking whether the Compendium would be reissued or the stamps (which some people are finding hard to get). You fire staccato questions minutes apart and leave readers to work out what you mean. It's a good idea to re-read your writings before you post as YOU don't have the benefit of an edit facility. I have no idea whether Royal Mail will be reissuing it but given the criticism I don't think it's likely. The fact that people are paying over £100 for it on eBay doesn't mean that it is WORTH that much: anybody who reads comments here from people who have bought it, including yourself, would be foolish to spend that amount of money unless they want it for what it is, rather than what it was (badly) designed to be. Readers will be interested in the 25 August update to this blogpost, which has RM's views about how the Compendium should be used, and news of a new album for all GMW stamps. Which is simply Royal Mail still telling people who bought the Compendium to stuff all the stamps in one plastic pocket (and therefore not be able to see at least one of them). It also means no refunds, and no solution to the fact that they designed something unfit for the purpose. Quite frankly, Royal Mail should be ashamed of themselves! At the very least, anyone who paid for the Compendium (myself included) should be given a discount off the proposed new album. I am really ashamed of the way Royal Mail has treated people over the Olympic stamps, They have been posted out to people who have paid good money for them, without the slightest of care how they should be treated. And I have sent them all back telling them so. Will it make any difference, No, because as usual they are treating us with contempt, I am sure, and they are just not bothered. Also I have just realised what the cost of Para Olympic Medal Winner stamps would be if they win a hundred, Wow it is going to be in around £360.00 Plus. I may have to have second thoughts this time. Err, 100 stamps x 60p = £60.00. 100 miniature sheets x £1.20 = £120.00. Can't see where you get £360 from - to keep up to date see also the 'latest news' posts on the Paralympics Gold Medals. I was working it out on Royal Mails Charges for a GB Medal winner Miniature sheet, and that was £3.60. where did £1.20 come from.I would be very interested then. "Each miniature sheet will comprise of two identical 1st Class stamps featuring the UK Gold Paralympic Medal winning athlete or team." That makes £1.20. Rest assured Royal Mail are springing some surprises for collectors on this one. There will be more to come tomorrow (Wednesday). Thanks for that information,I was not aware that Paralympics medal winners where going to be any different in price than that off the The GB Olympics Winner stamps. (I should have gone to speck savers)as they say. Any idea's on when this new album will be available and what it will look like? Sad to say I'm getting more info from their website via comments on the blog than I am getting direct from Royal Mail currently. I'll give them a nudge. It looks to me like a cheap plastic ring-binder ((albeit printed with RM's Gold Medal Winner branding), and designed to take plastic leaves for either FDCs or miniature sheets (or both) - sold at extra cost! It's like their budget ring-binder that has been sold previously (see http://shop.royalmail.com/albums+accessories/first-day-cover-new-style-album/invt/prod62150007/ for example) - solid 'contemporary rather than padded cardboard like the 'better' albums. It doesn't seem to me that it will be much use for the smaller Paralympic miniature sheets - unless there is an insert to which they can be mounted 4-to-a-page using photo-corners! I purchased one from Dauwalders of Salisbury, it is also a ring binder entirely made up of sleeves, and I think that could course problems with static and dust. Wow, first Gold Medal winner miniature sheet costs £1.20 and £1.50 postage and packing, from Royal mail.This time they are not going to get court out with the delivery span as the are recommending 10 days. I bought the compendium a couple of weeks ago and the miniature sheets arrived earlier this week; they were purchased as a souvenir of the Olympics for my son and to be honest I'm very happy - I've got around the issue of having a sheet too many by placing the two Mo Farah sheets in the same sleeve. Royal Mail were lucky; what if we'd won five more golds (or fewer than 28)? Equally, I can appreciate that in hindsight there would have been better ways to handle things and that the album wouldn't be suitable for every collector. However, for me it's a good product with a quality feel and having all the stamps in the sleeves I think anyone would be impressed; certainly when my boy grows up to look through it I'm confident it will be something he will treasure. Just in case my Email sent out does not get on to this site, for those not aware Royal Mailhave made a fantastic offer on Paralyimpic stamps. If you have ordered either the complete set of team GB gold medal winner miniature sheets or the complete set of Team GB gold medal winner first day covers, you will be eligable for 50% off thier Paralympics GB miniature sheets complete commemorative collection, as well as 60p off each Paralyimpics GB first day covers, when you buy the complete set of Paralympics GB first day covers. This Paralympics offer is limited to the same number of full team GB sets you have purchased. This WAS the wording on the website page about the Compendium.. We copied it for our records.! It states that you are subscribing to STAMPS !!! Not just a crappy album !!! So where are the stamos Royal Mail.,, Fekkin RIP OFF BRITAIN once again !!!!!!!!!!! I'm not sure that that description implies that your compendium would include the stamps. It states they are for keeping them safe, and then describes the stamps as they will be issued, available by subscription separately, and notes that prices will vary depending on the number of gold medal wins. The compendium book was at fixed price. I would suggest you take this up with Royal Mail Customer services if you are still confused about what you purchased. Their number is 08457 740 740 - best of luck. As far as I am aware they should not make a charge for items purchased untill such time as thay have been processed, I would sugest ringing and complainig as this usualy chases things up, as I have found on a number of occasions. I received my compendium a couple months ago, received the stamps on Monday 10th September, was very disappointed when I found I was one sheet short and even my disappointed when I found you are unable to fit them all in, in the correct pages. I telephoned the customer services desk yesterday and complained, I was told they would send out the missing sheet in due course. I was also told that I was the only one to complain!. When I asked could I get more plastic inserts, I was told they had been in touch with supplier and they would not be suppling any. So if I was the only person to complain. Why had they already contacted the supplier? I was told I could send it back and get a full refund. I have now sent a letter to the Philatelic Customer services manager. Why the compendium was not produced after the games or produced in a loose leaf form or extra plastic wallets issued. I do not want to put more than two in a wallet, as taken them out when you want to look at them will cause wear, which is not right you should be able turn the pages and see what you have. And as for buying their new Albums which is to cover up their error, if that is the case then if you purchased a compendium then should get the album free and the pages. as compensation for all this grief. Anyone know if London 2012 first day cover album will hold extra leaves to take all Olympic and Paralympic first day covers. `Having spent £300 on 2 sets of first day covers and 2 compendiums I now find out that the 2 are not compatible?? Please can someone tell me why when you ring up to order these are you you not told this?? After reading all the bits of paper that I have only on the back of the first brochure that I received back in May does it say for miniature sheets. Typical Royal Mail what a waste of money!! Rodders, if you don't like them send them back ask for a refund. "on the back of the first brochure that I received back in May does it say for miniature sheets"
Royal Mail have produced a budget price album for the first day covers - see http://tinyurl.com/9mmwzxu - ideal for your FDCs. It is not a matter of not liking them. When I ordered these over the phone I was asked which sets I wanted,it would not have taken much just to explain that the compendium only fitted the miniature sheets!! and as for the budget album I think previous post say it all. Royal Mail you pays your money and you takes your chance. Very surprised to recieve a Gold Medal Winners Album with seven pages of inserts today. Came with a cover note that it was being supplied free as I had ordered a gold medals winners subscription. This is obviously RM's way of making up for the compendium being a bit of a let down. Full marks to them for sending this out and was a totally unexpected bonus. No such luck for me I have had to purchase one, but I was quite happy with the 50% discount that thay passed on to me. Just hit a problem with my inserts, the 'front' of each page are faulty as the top two holders are only stuck half way along! Perhaps that why you got it for nothing ha ha. seriously ring Royal mail up on 08457 641 641 and they will send you a free reply lable for you to exchange.They are a little slow though, best of luck. I ordered both the Olympics first day covers and the Paralympics. When I checked with RM I was told that as I had ordered both sets I would be entitled to a FREE album and ten sleeves which holds forty covers. I had to buy a separate pack of ten sleeves so that I could keep both lots of covers together. Anyone receiving the clear fronted Olympic Album should heve received a 10 pack of sleeves. enough for forty covers. Extra sleeves are available from Royal Mail shop as follows. One pack (ten sleeves) £5.99 plus £2.95 P&P. If you never received 10 sleeves, complain to RM. I had to send all my Paralympics stamps back after waiting all this time for them to be delivered, because nearly all of them had been damaged on the left hand side just off the stamp, it looked like they had damaged them putting them in the sleeve, so I don't expect to get them back now untill Christmas, I was very dissapointed. I have received my Olympic 2012 FDCs plus a free album with 10 sleeves (enough to hold 40 FDCs, plus I have now received the Paralympics FDCs plus another free album with 10 sleeves. Another belated complaint from me! When I eventually received all my mini-sheets, I found that they had been torn from different places on the A4 printers sheet and, as a result, have perforations on two, three or even four sides. And on the sides which have perforations, these are all odd - some sides have long perfs and others look so short they could almost have been guillotined. There is the odd bend to some mini-sheets, presumably resultant from the manual process of tearing them from the A4 sheet. If it's any consolation dealer stock of recent issues has been coming out the same way, and not as well packed as in the past. I suspect it's too much haste, too little care. Although they probably won't correct the 'from different positions' problem, if you have damaged stock - bent, scuffed, etc - they should replace it. If they don't, and you would like to exchange for better copies, email me. We should be able to come to some arrangement; I'm using paralympic sheets to post > 100g Large Letters at present! Royal Mail has declined to correct the "different position" issue even though it looks a mess. I am sure they will change any damaged stock (once I can face working out precisely what needs changing). I suspect I will end up buying a set of singles for Lighthouse pages and at some stage may well just stick the sheetlets on Ebay in disgust!! Thanks for your offer to help out if I get stuck though. PS In case anyone is having similar problems posting here. My earlier inability to post was down to not having third-party cookies enabled. Steve thanks for letting us know what the posting problem was. I can now tell anybody else who says that they can't post - and there have been a few!! There is no need to purchase the special Olympic binder. Anyone buying the complete set of FDCs should have received the FREE binder complete with 10 sleeves. Extra set of ten sleeves available at a cost. The wording in the RM shop, is very misleading. It gives the impression that you have to buy the FREE album. Buying only applies to the one off collector of these special FDCs. The regular collector should be receiving it free. After sending back all my Paralympics stamps back to Royal mail on the 5th of October because they where all damaged, I find that they have been lost some ware in the system and on ringing them up today they tell me that there is no record of me ringing them up to complain about them, what a complete farce. I am now having to send them all the correspondance again with a letter of explanation, It could be that I have to pay again for them. I am really dissapointed the way that Royal mail are handling the way they sell these stamps, they are all so full of excuses as to the delays on all the new stamps that have just come out, I am wondering if they can handle having a shop or they just don't care. I would have thought that by now, there would be a selection of albums available to place all my printers sheets from the Olympics issues.....But I can only find one album from Stanley Gibbons. Can anyone tell me what the quality of the album and plastic leaves are like - and are additional leaves freely available. ?